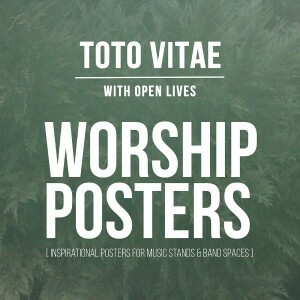 TOTO VITAE | WITH OPEN LIVES uses the arts of photography and the written word to inspire you – and worship servants in your local church. Original photography, soft filters, and compelling quotes come together to give you full-color, contemporary, high-res posters you can print on any color printer. Just trim and frame, or place in a plexiglass plate. 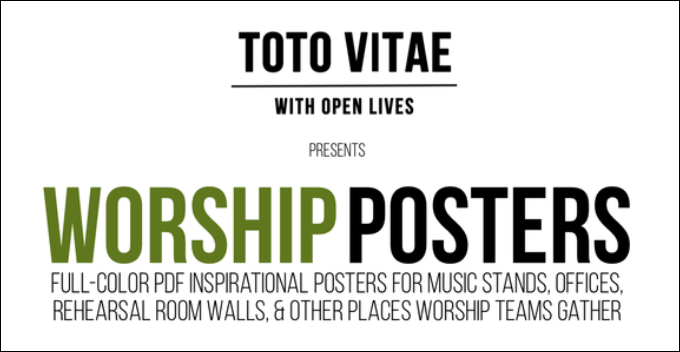 Place on music stands, on office walls, in rehearsal rooms, foyers, youth rooms, or even in your sanctuary space. Any place worship teams (or worshippers) gather. Or, use it as a digital training resource for your team.